compositesportal.com it’s the first website dedicated to industry and academia of composite materials in Italy. Composites Portal is indispensable for any entrepreneur who wants to have a complete view of the news in this area, a meeting point between supply and demand. Information and innovation while, at your service. The home page, at first glance, appears in all its simplicity and completeness: once to reach businesses, all their products, the latest news, major events, technical articles signed by experts. The world of composites opens each day directly on your desktop, just click to get all the information you need with a great saving of time. The themes represent a first level of detail related to a particular type of technology or product that is accessed directly from the home page. Within them, these categories suggest, in a listing, news, insights, technical descriptions of products and services produced by companies. 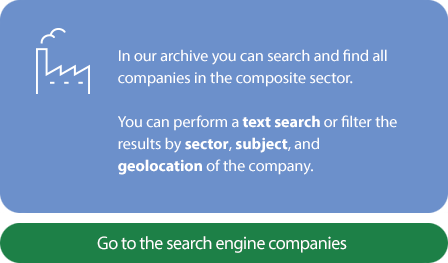 Companies operating in the field are brought together in a vast and detailed database. The products made or distributed, the services provided, the category of membership. In a few moments on the monitor will display the card company, a real concentrate updated information and reliable. an identity card easy to navigate and quick to find. Through a simple form and functional organizations provide users with all information relating to the production and marketing of their products, business contacts and location.